Human Rights Activists News Agency (HRANA) – On Thursday, August 30, 2018, an Arab poet and activist was detained in Mashhad after attending a private poetry reading. Security forces produced no warrants at the time of his arrest. 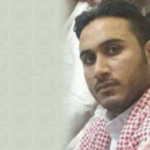 HRANA verified the identity of the detainee as Abbas Torfi. Torfi is actively involved in Arab poetry, culture, and literature. The reasons for his arrest remain unknown. No information is currently available regarding his whereabouts or conditions post-arrest.